On April 12, 16 sailors representing nine yacht clubs from Long Island, Westchester County, New York and Connecticut raced nine-foot Dyer Dhows in the annual Yacht Racing Association of Long Island Sound Frostbite Championship, first held 60 years ago. The perpetual W. J. H. Dyer Frostbite Trophy is awarded to the winner. Names such as Sutphen, Knapp and Shields are engraved on the trophy, which goes back to 1954. Fotis Boliakis (sail # 8) is the 2014 YRALIS Frostbite Champion. 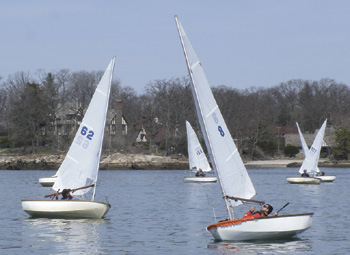 The regatta, run by the Mamaroneck Frostbite Association, took place at Beach Point Yacht Club in Mamaroneck, NY, with racing in the outer harbor. This year’s Championship was won by Fotis Boliakis of Norwalk Yacht Club, who showed great consistency with two firsts, four seconds, and no finish worse than sixth. A light to moderate southwesterly allowed Race Committee Chairman Bahar Gidwani to run 10 windward/ leeward races. Boats were exchanged every two races at a designated swap dock, and no member of the home fleet was allowed to sail their own Dyer. The perpetual trophy was awarded in addition to three keeper prizes. Besides winner Boliakis, second place went to Britt Hughes of Milford YC and third went to Andy Kaplan of Larchmont YC, who was equal on points with Barry Parkin of Riverside YC but won the tiebreaker. An award was given to the top female finisher, Ellen Quinn of Riverside YC, who finished 6th overall. Founded in 1958 by Emil ‘”Bus” Mosbacher, Jr., Warner Willcox and Howard McMichael, the Mamaroneck Frostbite Association has sailed out of Beach Point YC for 10 years. Membership has doubled in that time to the current 55 active sailors. The MFA uses a slightly larger sail than most other Dyer fleets and also has a storm sail for heavier air. The fleet has several charter boats available to encourage new members to try frostbiting, and many members buy a boat after the first year of racing. Visit mamaroneckfrostbite.org to learn more. « The 2014 Interclub Nationals: A Regatta of Extremes!